I wish I could say that the days have grown cooler here in San Diego and that we’re enjoying crisp, autumn breezes, but it’s still blazing hot in these parts. Today, the thermostat got to 87 degrees Fahrenheit before I broke down and turned on the AC. So, even though it’s still downright tropical around here, summer is officially on the wane. It’s time I shared with you some of the cute patterns that were on my hook the past few months. People are having babies right and left, so I’ve been crocheting lots of gifts. I absolutely fell in love with this two-legged bunny from Lucia Lanukas. I love the two-tone dipped color scheme! I whipped up an earflap hat with a matching pom pom, and voila — great little baby gift! What baby gift do you typically give when you can’t make it to the shower? A gift card, right? I always like to crochet a little something when I’m giving a gift card, just so that all the ladies can ooh-ahh over something when the mom opens the present. The LOOP Baby Toy by Amy Herbst is a classic. I don’t know what makes this one so appealing. I think it’s the modern color scheme. I varied the thickness of the rings, and I added a third — just because. I also whipped up a little bear rattle to go with it. I invented the pattern on the spot, and I didn’t really write down what I was doing. I’ll have to refine that one a bit and share it with you guys. The kids at church have been requesting little stuffed animals, and I just can’t resist. Two little brothers wanted dragons, so I made the older boy Lucy Ravenscar’s Fierce Little Dragon, which is a wonderful pattern. I didn’t get a photo of that one. For the younger boy, I meshed that pattern with Kristi Tullus’ Baby Dragon Rattle, and I was really pleased with the results! Their mom sent me a picture of “dragon time” before bed. Bless my heart! A little girl requested a pink bunny with a blue nose and purple ear lining. Dear, dear. I thought it would turn out looking like a big mess, but it actually came out much cuter than expected. I used Stephanie Lau’s Spring Bunnies pattern — it’s a real winner! Last but not least, I mentioned in a previous post that I was crocheting an afghan using the Maybelle Square by My Rose Valley. I finally finished it and decided to give it to a mom-to-be instead of a bride-to-be. I think it works better as a baby blanket, anyway. I joined the squares and bordered the afghan with a simple reverse single crochet. It provided a really nice raised edge. I blocked the squares to around 7.5 inches, and the whole blanket came out slightly larger than crib size. There were other little projects thrown in here and there, but these are my favs. As for books, I read “Cuckoo’s Calling” by Robert Galbraith (a.k.a. J.K. Rowling) and “The Maze Runner” by James Dashner. Both were guilty pleasures. There was too much cussing for me in “Cuckoo’s Calling,” although it was a completely engrossing story with awesome characters that totally sucked me in and compelled me to finish. “The Maze Runner” was slow-moving, and I couldn’t really relate to any of the characters. Both are series premieres, but I probably won’t be continuing with either. Right now, I’m reading “The Brothers Karamozov” by Dostoevsky (Constance Garnett translation). Overall, it’s a total winner, but there are some slow bits — the religious and political rants, particularly. Now, for something super exciting. 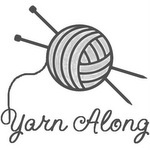 We’re having a yarn crawl here in San Diego! I’m gearing up for it this weekend. I’ve never done one of these. Have you? What was your favorite summer make? Your favorite summer read? Hi there! Lovely patterns especially the cute bunny! !! I am an amigurumi fan and I will definitely be crocheting it very soon. These days my favorite thing to crochet are some winter strappy booties. 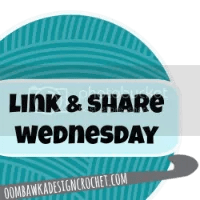 Pingback: Hookin On Hump Day #80 - Link Party for #Crochet and #Knitting! Love all your projects, but that little two-legged bunny is just precious! I think I may have to make one. Yes! It’s really unseasonable. We did get a MUCH-NEEDED downpour last evening, though. It rained hard for maybe an hour, but it didn’t cool off at all, so it was like the greater San Diego area was taking a hot shower. Haha. I’ve made a Fierce Little Dragon myself! I really liked the pattern. I absolutely love how you attached your granny squares! I’m making a blanket for myself and might use that technique when it comes time to join the squares together. Thanks so much, Jess! Yeah, I’ve made the Fierce Little Dragon before, and it’s just adorable. The way she constructs the nose is genius! Here’s a great tutorial for reverse single crochet: https://www.youtube.com/watch?v=jhSbycwfpdo Hope it works out for you! You’re animals came out super cute! Oh, I didn’t receive the one about enlarging the doll. I haven’t created a larger pattern — although that’s a fantastic idea — but I do have some suggestions. I’ll shoot you an email.